Some people are realy strange! And this was a present from his girlfriend! He told me, he might get a penguin to x-mas. counted the people complaining about Fedora and who want to join the Rank of Debian guys, too. 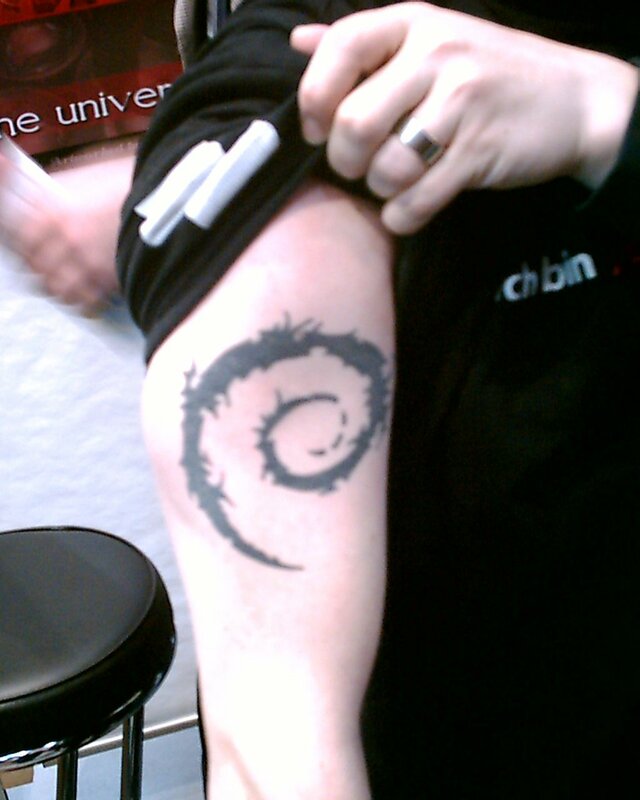 ... of my live report from this years Debian booth at CeBIT! Nothing much to report so far (which might already guessed, since I have time to blog). But if you are interested in a nice asian restaurant near to Hannovers fairground, we have been in a realy good one with nice atmosphere yersterday. Since I'm all allone, I allowed some FSFE and Skolelinux guys to join my little booth, at least until the other guys arrived, and we get more crowded. ...there was a guy, who is using Debian for nearly one year, and who found it quite easy to install, although he has no Linux experience. So I hereby send his thanks to the debian-installer team.